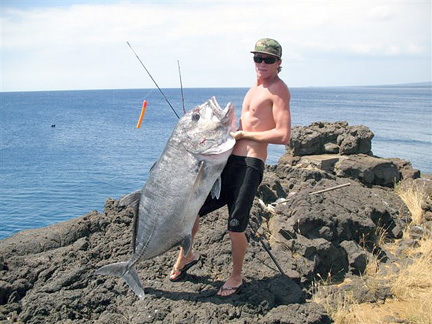 Devin Hallingstad battled his 120-lb ulua during a fishing trip the famed South Point on the Big Island of Hawaii. He used 80-lb test Ande line and a Penn 6/0 reel to fight his fish to shore. Amazingly, Devin's ulua also topped the Big Fish list for 2008. This list is kept at The Charter Desk in Honokohau Harbor and includes all catches--even those from the charter fleet.